In a world of purple, Shard was just a Carmariller. Not a blue spiky petpet of destruction like she hoped, but a simple brown and yellow Faerie apprentice to any Neopet she'd one day be assigned to. That thought drove her mad. Why? Why was she cursed to such a feeble, insignificant body? A prediction of the Faeries that she'd be a threat otherwise? Or just dumb luck? The only petpets who mattered were her family, though they weren't ideal. Teasing her unmenacing appearance, calling her 'Normie'. They were simply brutes as opposed to her personality, sharp as a glass shard and just as dangerous. They lived on a small island above Meridell, Darigan Citadel the petpet's family called it. Petpet Battles were always around the corner, free training and entertainment. There weren't any Petpet shops so Shard was free of the responsibility of having a Neopet owner. That was until she fell. It was a quick flash consisting of a rock hitting her wing (thrown by one of her unruly brothers), but off her humble island to a hill in the medieval land. From there it was shouts of "Faerie!" "It be a Faerie thing alright." "Send it back to the cloud land." Shard went from the despairing island to the whimsical Faerieland within a day. She hated it. 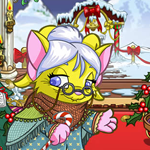 Not the separation, not the anxiety of all these young pets judging her skill, not even the dainty annoying petpets in her cage, but the nerve of the Neopets who sent her here and are trying to sell her! You do want to go that extra step for use, right? Yeah? Well sit down my friend and let me tell you a tale of the things you may not have tried (or heard of!!) to do for and with your pets! Granny Hopbobbin, a sweet ol' grandmother? Or a millionaire mastermind?